Theresa's Mixed Nuts: You Color My World ♥ Summer Coloring Fun Days Ahead! 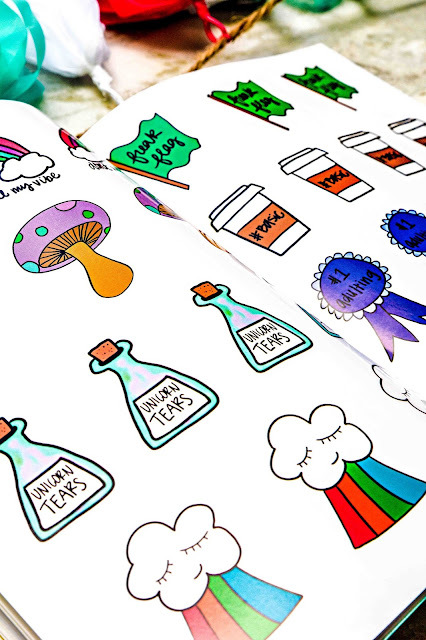 You Color My World ♥ Summer Coloring Fun Days Ahead! Disclosure- I received the mentioned product courtesy of the sponsor for the purpose of this review. All opinions are genuine, based on my experience with the product, and have not been influenced by promotional items. This post contains affiliate links. Please see my policy tab for more information. The countdown is on. The girls will be celebrating another school year down in just two short weeks and we couldn't be more ready! If you are like us, your year has been packed full of activities and the promise of summer break with no school commitments has you giddy with excitement. Now, as excited as I am about the idea of sleeping in late, no homework, and no early morning lunches to pack, the one thing I am not looking forward to is, "I'm Bored!" I think that's the universal phrase that grates most parents nerves during summer break. Thankfully, I've got a secret weapon stashed away to help blast away summer boredom blues.... New activity books that the girls and I can do together! If you've been here a while, you know that we love to get our craft on, especially during the summer months. 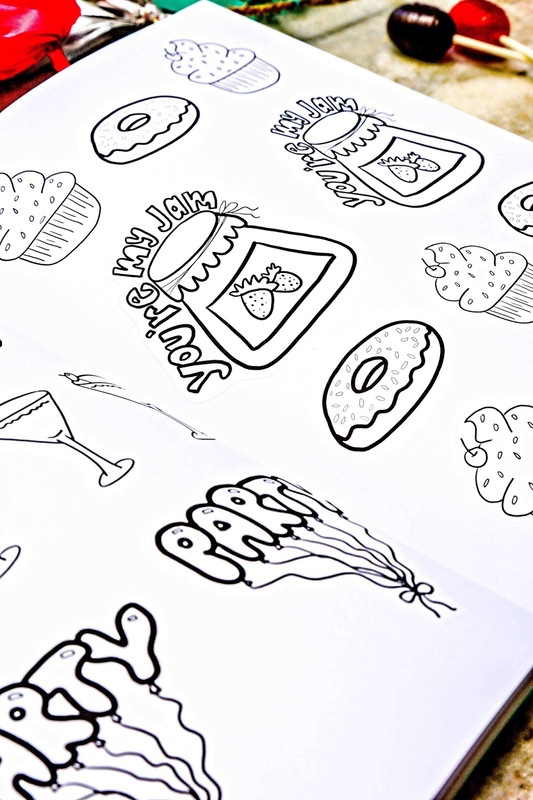 One crafty activity that we all love here are adult coloring pages. 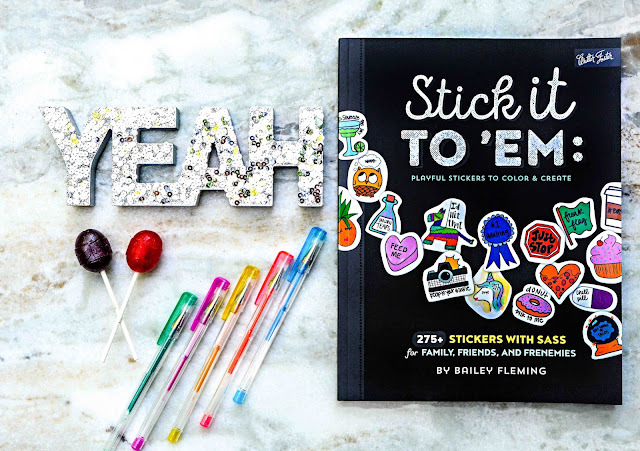 So, when I heard about Stick it To 'Em: Playful Stickers To Color & Create, a sassy book with over 275 stickers to create, color, and share, I knew I had to have it in my crafting arsenal to break out when the girls start getting stir crazy in the summer. 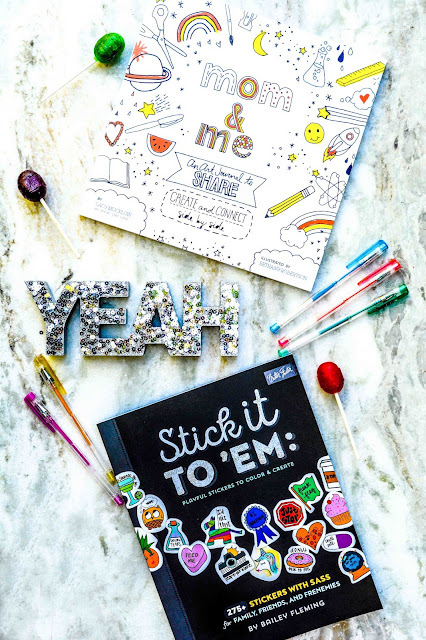 Stick it To 'Em offers guided instructions for easy drawing and lettering techniques, as well as step-by-step tutorials all designed to get your creative juices flowing. 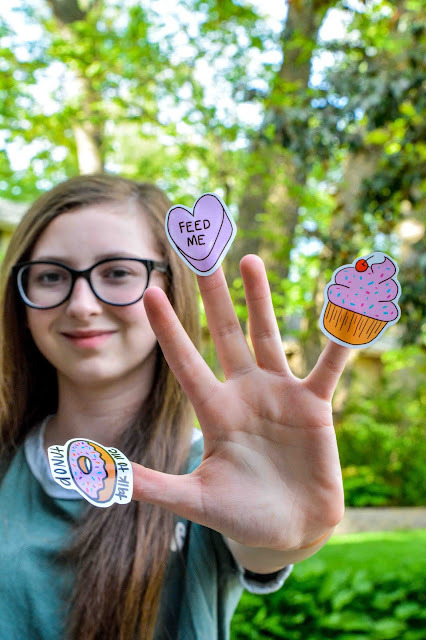 There are over 35 pages of stickers, some ready to pop off the page so you can immediately stick them wherever your heart desires, some black and white stickers ready for you to color in, and some blank sticker pages so you can design your own one-of-a-kind sticker creations. There are multiples of each sticker, so each of us can take turns putting our own unique spin on the designs. Allison was itching to start using the book as soon as it arrived, so I gave her a little sneak peek so she'll have something to look forward to during the slow days of summer. She then claimed a few of the sweet treat stickers to pass out to a few of her friends at school so they'll have something to remember her by over break. Allison loves this book so much, if we happen to do a holiday gift guide this year, this book is definitely going to be included in it. The other book I have stashed away is Mom & Me: An Art Journal to Share. I don't think this book would be great for older teens, but for the 6-14 age set, I think it's perfect. 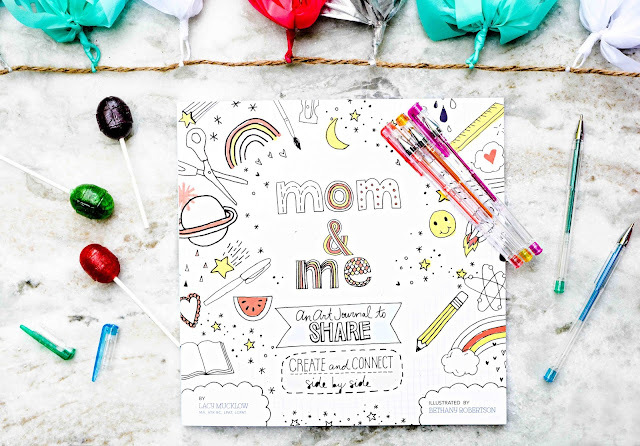 This book is a full color art journal that mom and child work on together. Side by side pages are almost identical, one for the child to work on and one for mom to work on. Mom and child can write each other letters, share the things they are thankful for, write out their emotions, and share their future adventures, hopes and dreams. Each page is beautifully illustrated with blank spaces ready for mom and child to add the finishing touches to the page. 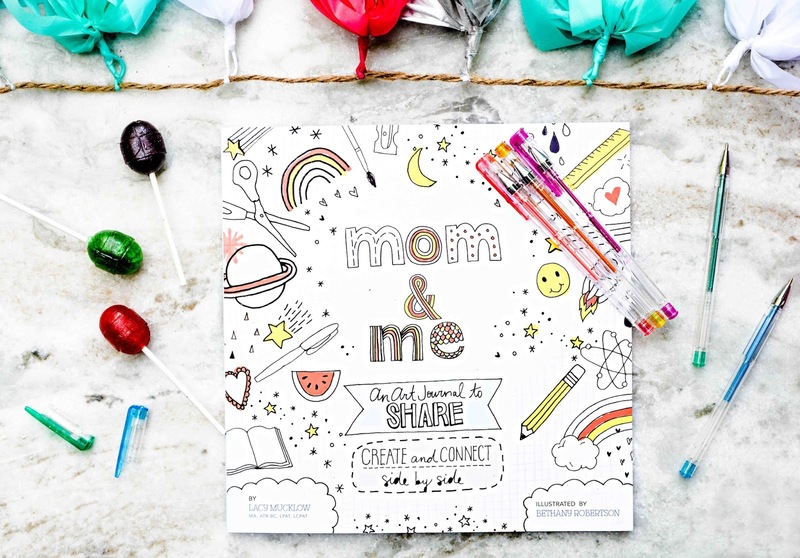 This book is an awesome way to open up the lines of communication between mother and child through art and creativity. 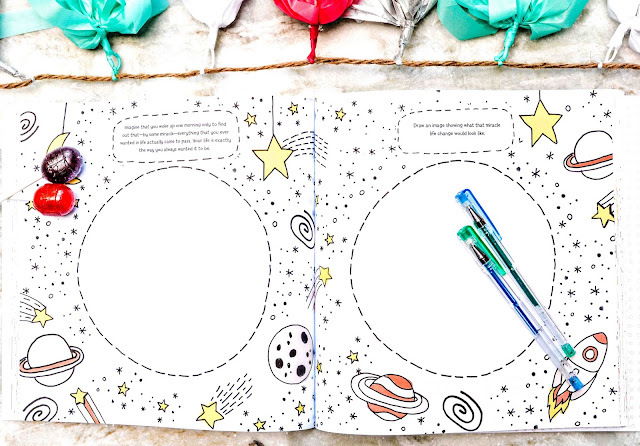 There are 127 pages in the Mom & Me Art Journal, so you'll have plenty prompts and activities to keep you busy all summer long. Each book is available in major book retailers like Amazon, Barnes & Noble, Waterstones, and Booktopia across the US, UK, and AU. Be sure to order your copies before your kids are out of school for the summer and "I'm Bored" becomes the phrase of the day. What activities do you have planned to keep the kids busy this summer? The I'm bored must come a time or two, but will all the trips you take, has to be less than most. Sure gives them a little extra fun. She has food on the brain I see haha Mom and child one would be neat for the younger kiddos to do. I love the stickers that come with it. I like to give these type of coloring books as birthday gifts. They fit a lot of ages. These books do make great gifts. I am giving the Mom & Me Journal to my 8 year old niece for her and her mom to work on this summer because these are the types of gifts they always request on holidays and such. oh, on that one photo for a second I thought Allison was so sad for her big sister leaving for college that she started going gray :) A lovely book indeed! It's just the way the sun was hitting her head ;) She ain't sad about Mariah leaving for one second. She's already planning on moving into her bedroom once she's gone. A lot of good it did us redoing her bedroom last year for her to give it up and move into Mariah's room now. That looks like so much fun! The only thing better than a coloring book or sticker book is a coloring AND sticker book. I bought myself a coloring book for Christmas. It's such therapy. My sister in law is SOOO into coloring. I think this would be so fun for her to do with my niece. I think this would be a fun project to do with my kiddo when we're traveling. Will keep their mind occupied and all-around just fun to do. This is super cute. My daughter would love this. 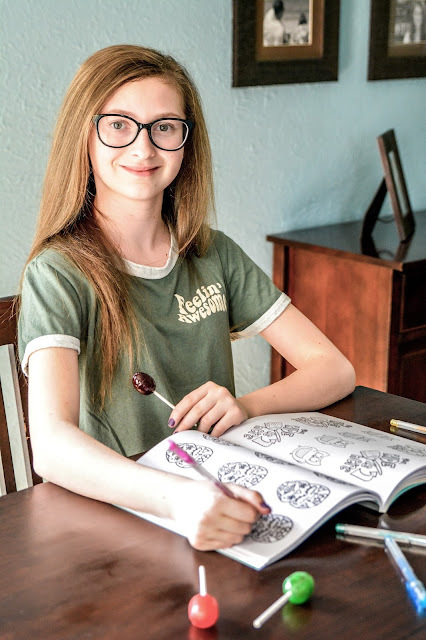 She has a ton of coloring books in her room...and she is 18! Oh how fun! The stickers look super cute and I can imagine that they're a lot of fun to work on! I love those stickers. The donut talk to me sticker is so fun! I love the idea of an art journal to share. What a fun book! I absolutely LOVE to color, I just wish I had more time to do it. I think I might just have to make some time this weekend! I work as an aide at the elementary school and one of my favorite things to do is sit down with the kindergarten kids and color with them. :) This looks like a fun book that the older kids would love! Anyway, the boys have two weeks of drama camp... and one week of marching band camp, so the summer will most likely fly by as usual. These are really cute!! I bet my kids will enjoy summer so much if they have this! It does sound like a lot of fun. It's going to be something that the kids will enjoy. What kid doesn't love stickers after all. It would be nice gift as well. Looks like a great way to spend time with the kids. Mine are all grown ups now and I don't think my sons would enjoy coloring fun with me. LOL. I will give them as a gift for my niece who will be celebrating her birthday in July. I was just coloring last night! It's definitely not just for kids. What a fun activity book. I love the colorful stickers. I wish my daughter was still young so we can do this together. Oh well, years fly by so quick. I am going to let my cousin know about this. Her daughters are just about the right age for this coloring books. This is great! I will share it with my niece. She really loves doing like this. Very creative! Oh my goodness. Those are so fun! 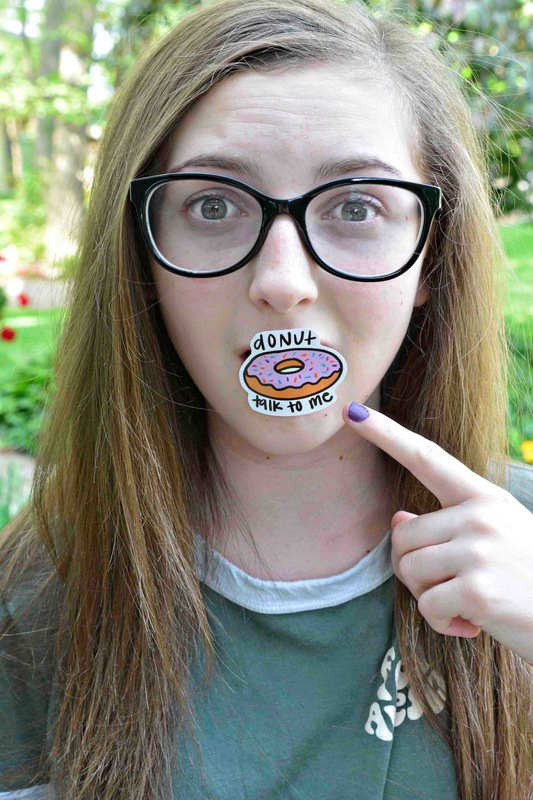 Stickers are always a hit, and these have the extra layer of awesome with the ability to color. I need to check out those coloring books and stickers.. now that I am shopping around for things to entertain my kids! Great stuff!